The Northern Hemisphere is once more beginning its lean towards the Sun, with the spring equinox taking place last Friday, March 20th. People all over are welcoming the spring sunshine and new growth in many ways. 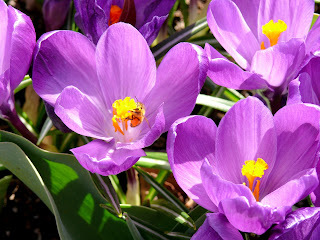 Here is a collection that shows some of the signs of spring as we shake off the last bits of winter~ Our Weekend Getaway to Skagit Valley. 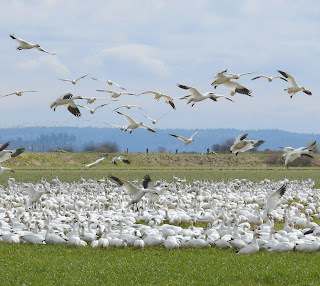 A flock of snow geese fly over Skagit Valley Wednesday, March 21st, 2009, WA. The birds migrate from their winter area of the western Gulf Coast to their summer range of northern Alaska and arctic Canada for breeding. The bird and flower valley are such a natural beauty! Lovely place on earth! Beautiful! Warm Welcome to Spring. Can't wait. i remember our visit to skagit valley. lovely place. skagit valley is a must see place during spring. I really enjoyed my visit to the tulip festival.